98% of all our bags are made of genuine leather. We use cowhide leather. Our animal hide is sourced humanely. We will never source from suppliers who kill just for the hide. We have 2 bags currently made of Vegan leather. They are the Bordeaux and Lisieux bags. Our vegan leather is made responsibly and in a way that is not harmful to either the environment or the user. 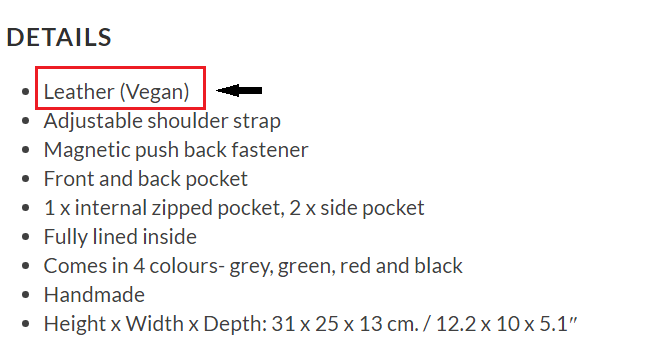 Many of our customers are asking us to make vegan bags an option and currently, we have a plan to make some of our offerings using totally free from animals. With this said, we have to reinforce the fact that our animal hide is sourced humanely. We will never kill just for the hide. 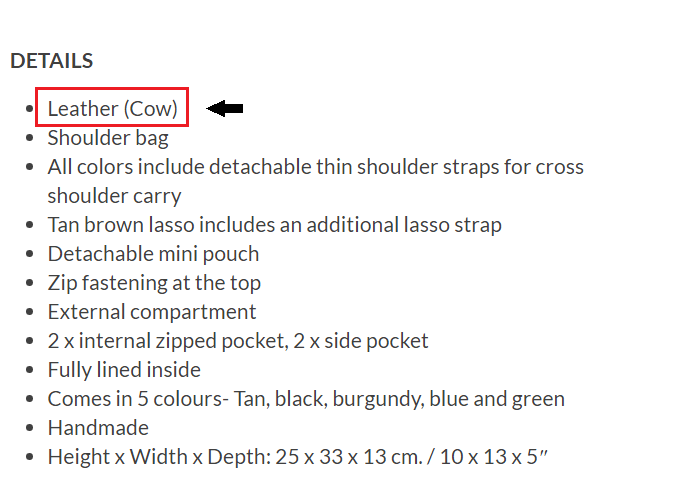 How do we tell if the bag I'm interested in is leather or vegan? We mention the materials used for every bag that we offer.